Several of the asteroids that have been spotted passing with the orbits of the moon and even Earth's communications satellites. Near-Earth asteroids are space rocks with orbits that bring them uncomfortably close to Earth. NASA and astronomers are constantly on the lokout for potentially dangerous near-Earth asteroids, space rocks that could potentially one day threaten the Earth. 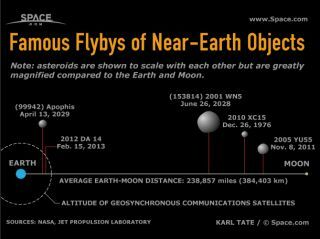 Several of the asteroids that have been spotted passing with the orbits of the moon and even Earth's communications satellites. Check out some of the most well-known asteroid flybys, in which asteroids have flown close by Earth without hitting our planet or exploding in the upper atmosphere.